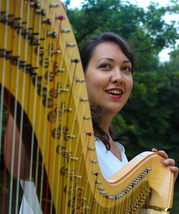 She has a career as a professional musician (soloist, chamber music and orchestra) through France. She has performed in places such as the Louvre Museum, the Orsay Museum, the Palais de Chaillot, the Embassy of Great Britain, the Palais de Justice of Paris, the Château de Breteuill, the Château de Gouvieux, The Chapelle Expiatoire to name a few ... and thereby providing her solid references. Alone or duo, trio, or also accompanied by a string quartet, she knows how to adapt her musical style according to different themes or specific requests and ensures a quality and irreproachable performance, valued at many events and recitals.